*From the north:* Take Route 93 South to Storrow Drive to the Fenway exit. *From the south: Take* Route 93 (the Southeast Expressway) to the Massachusetts Ave. exit. *From the west:* Take Storrow Drive to the Fenway exit or, from the Mass Pike Extension, take the Prudential Center/Copley Square exit. *By Subway: Take the Heath Street/Brigham Circle "E" Green Line train to the Symphony stop, any other Green Line train to the Hynes Convention Center stop, or the Orange Line to the Massachusetts Ave stop. 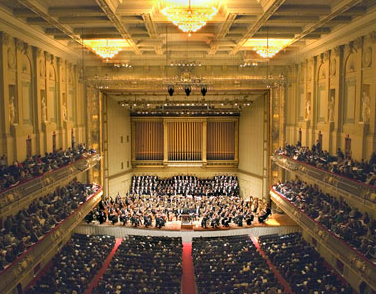 *By Bus:Take the Massachusetts Ave. bus from Harvard Square in Cambridge directly to Symphony Hall. Prudential Center Garage : For your convenience, the Prudential Center Garage offers a discount to any patron holding a BSO or Pops ticket stub for that evening's performance if you enter the garage after 2PM. Garage located at 800 Boylston Street, Boston, MA. Westland Avenue Garage : Parking is available for Symphony Hall patrons at the Westland Avenue Garage near Symphony Hall. 35 Westland Avenue, Boston, MA 02115. Christian Science Center Garage : Parking is also available at the Christian Science Center Garage. 175 Huntington Avenue Boston, MA 02115 (Belvidere St), Boston, MA, 02115. NEC Open-Air Parking Lot : Parking is also available at the NEC Open-Air Parking Lot 247 St. Botolph Street. Across from Matthew's Arena. Event parking is $20. Gainsborough Garage : Parking is also available at Gainsborough Garage. 10 Gainsborough Street, Boston, MA, 02115.Directions From Copley: West on Huntington Avenue. Cross Massachusetts Avenue, passing Symphony Hall on the right. Left at the first traffic light onto Gainsborough Street. Pass NEC on the right. Uptown Garage is the next building on the right. Please note: entrances to the following two garages are side-by-side, please look carefully to be sure you have chosen the correct entrance.